← Thanks For Another Good Year! Hubby and I were discussing cow farts the other day. We didn’t suddenly turn to each other at the dinner table and exclaim, “Cow farts!” No; our conversation actually began as a semi-serious discussion of global warming. It’s just that whenever I’m present, the conversation tends to go rapidly sideways. I blame this on my brain’s annoying tendency to latch onto useless but amusing bits of trivia. Anyway, that got me thinking about cows in general. You know how some things are intrinsically funny? For example, bananas are funnier than oranges. Turnips are funnier than, say, lettuce or radishes. And cows are funnier than horses or just about any other farmyard animal. And cattle are funny-looking. They could have been designed by a six-year-old kid: a big rectangular block supported by four knobby legs with a head stuck on the front. Oh, and a tail on the back. The tail always makes me laugh, too. The skinny rope with a tassel on the end is funny in itself, but what truly amuses me is that cows and lions have exactly the same tail. I don’t know whether to congratulate the cow on its badass likeness to the king of the beasts or offer my condolences to the lion for getting tagged with the same hair-handle as the ungulates. And if you’ve ever seen a cow jump a fence (they are actually capable of jumping, though not very high), that in itself is giggle-worthy. Unless the cattle in question are escaping your pasture, in which case it’s not very funny at all. Fasten your seatbelts, ‘cause here comes a topic-swerve that’s only loosely linked to cow farts: doobies. (That’s a funny word in itself.) Yes, I’m talking about bombers, joints, reefers; wacky tobaccy in general. How is this related to cow farts? Well, cow farts are funny. And doobies are funny cigarettes. Why am I making this extremely tenuous connection? 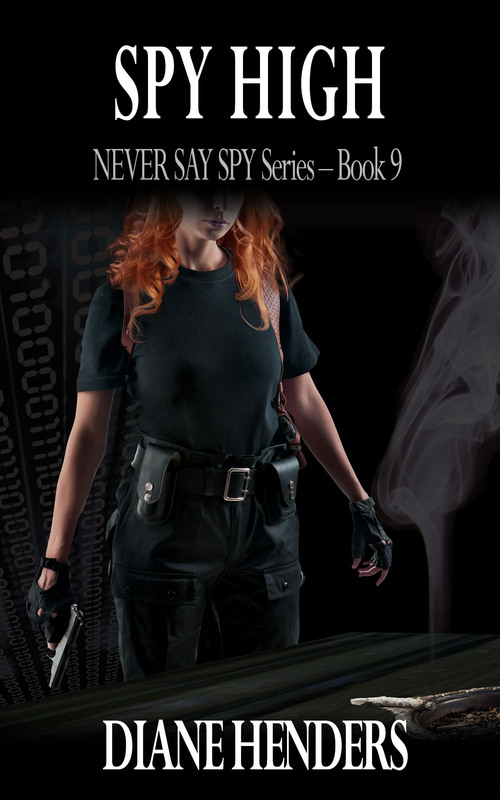 Because it’s a cheap and sleazy segue into announcing that Book 9, SPY HIGH has cover art and a release date! Woohoo! My beta readers blasted through it during the Christmas holidays – thanks, guys, you ROCK! Now I only have to do some final polishing and it’ll be ready to roll out the door. The tentative release date is January 16, 2015 (to be confirmed next week). After four uneventful months spent guarding her boss’s eccentric hippy parents on an isolated raincoast commune, bookkeeper-turned-secret-agent Aydan Kelly is beginning to hope mildewed undies will be the only hazard she’ll face. But some of the blissed-out flower children are not what they seem. Aydan discovers a plot to kill her lovable charges, and in her fight to protect them she unearths the commune’s deepest secret. Suddenly she’s facing dozens of enemies who threaten the lives of all the innocent commune members as well as her own. I remember reading once (or twice, come to think of it) about a herd of cows that collectively turned nasty and attacked ramblers walking in their field. Cow farts weren’t mentioned in the / either article, Diane, but they must be to blame. Cows just don’t turn for no reason. You should have gone with a cow fart on the cover. Having been born into basically a suburban environment, out of town, across the tracks sort of, but loving all things country, then having been thrust into real country as an adult and immediately having to learn how to milk a cow, I can attest to the truth of gas passing cows! Being trapped into a milking stall, close quarters, bucket in hand and a jovial Jersey cow that took forever to milk (she loved to torture me by holding back) she would periodically blast me with her built up gasses. Then, knowing how that made me feel, she’d turn her head around, look at me with those “big glassy eyes” and then Moooooooo at me. She was such a sweet heart. I still love the country but will let the cow milking go on by. You have just made my day and days to come with the announcement of #9. My finger is set to the “Buy Now with One Click” also and making sure my Kindle is completely charged. Happy dance goin’ on. Love the cover. Congrats on being so close to publication! And thanks – I’m excited about getting Book 9 out the door! And last but not least — YAY! Can’t wait to read #9! Congrats to you Diane! I can’t imagine the dedication it takes to write one book let alone nine! Thanks, Sue! They are, aren’t they? But I have to say I’m disappointed to discover that they aren’t actually perpetually inebriated. A vivid imagination is obviously one source of your bountiful creativity in the “Spy” series. Congratulations on number nine! I see that cows and I have a lot in common – both funny-looking, drunken, farting enviro-pirates. LOL! And so are we all, though the ‘drunken’ part is intermittent. Thanks, C-a-L! We lived on a farm and raised cattle when I was a kid a hunnerd or two years ago. In general, you are absolutely correct on all counts regarding bovines. Please be advised, however, that one occasionally encounters a cow that CAN jump. We had one such. I’ve seen her stand flat-footed and jump a six-foot-tall corral fence. She didn’t exactly clear it, but she got over it, and it was no flimsy affair, that. Wild as a march hare, she was. The only reason dad said he kept her was because she raised good calves. One day, she chased him clear across the pasture, over a good fence, and into the back of his pickup. The next day, he gathered some help from the neighbors (I was probably six or seven at the time and not much help with the ordeal) and after a battle of epic proportions (and a great profane cloud of expletives from the grownups), off she went. We spent the next several days fixing fence. I was a big help with that. Great cover! I am fully prepared to hit the ‘buy with one click’ button on Amazon so they can squirt it straight into my Kindle pile. And so much for the whole “placid cow” image. I was laughing out loud imagining the scene! Six feet is amazing – I’ve seen them jump about three feet and even that looked vastly improbable. You must have had the Olympic cow-jumping champion. One takes the bad with the good. The good, in this instance, was a bull we had. A Brahma cross (probably one-eight Brahma) example of the breed. Had a sizable but not enormous hump. Huge shoulders. Thick, horizontal horns. Moved like a cat and rippled when he walked. A thoroughly impressive fellow. We raised him from a weaned calf, and he was gentle as a lamb. Good, in this case, became too good. He loved to have his back scratched. He’d stretch his neck out and lean into you for more. And if you quit before he was ready, he’d follow you around and nudge you gently until you started again. As he grew, we noticed that nudging gently means something different to a thousand pound bull than it does to most humans. When he passed two thousand pounds, his playfulness became more than a nuisance. I hated to see him go, but it got to the point that he would open some seriously closed gates without even trying. Just to get his back scratched. LOL! He sounds like a character! Poor guy; he probably wondered why his humans kept getting smaller and weaker. Sorry, Love. Methane is a byproduct of rumination, mostly from cellulose and other cell wall structures. That it poses some threat to the environment is a figment of the anti-food, anti-agriculture, anti-everything NGOs and their useful idiots. There were at one time 66 million bison in North America, while there are roughly 30 million cows give or take. Bison ate only roughages (NO grain) so produced more methane than the equivalent cow whcih gets some grain. The by products of rumen fermentation are called volatile fatty acids (VFAs): acetate, propionate and butyrate being the big three with sometimes lactate in an acidic rumen. Alcohol may be produced in small amounts by some microbes during fermentation but is usually quickly grabbed by other microbes to make VFAs. No alcohol gets past the rumen in any quantity unless it is ingested in eg windfall apples that are starting to ferment at which point you will see some happy drunken cows. And you thought I couldn’t remember anything from school! There’s something better. Saw it on TV a few years back. An elderly couple tried to market something like an adult diaper with a section in the back that held an activated charcoal panel. Yep, fart filters. The gent actually fabricated the drawers after decades of complaints from his wife. She said they worked very well. I haven’t seen any on store shelves yet, but I think he did manage to get a patent on ’em. OOPS!! HOLEY COWS!! MY BAD!! You’ve already had that conversation. Duh. That’s why the text was highlighted. A thinly disguised URL. It’th okay. Your mylar thong will be our dirty little thecret. Geez Diane! You’re a riot! And it’s twice as funny when I’m sitting here at work reading this stuff!! No one has ANY idea what I’m laughing at so they think I’m just crazy/weird. Sooooooo looking forward to Book 9; and yes, definitely love the cover art!! As always, all the best to you and your talent. Keep the good stuff coming!!! I hope you enjoy Book 9! Nice segue! Love the cover art. Good luck with the new book and thanks for making me think of a hammered methane factory the next time I see a cow.